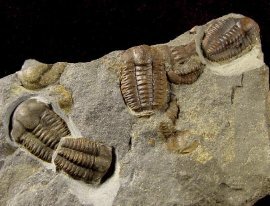 Trilobites belong to the Arthropoda, like Insects, Spiders and Crustaceans. They are known from the cambrium time until the permian, but the biggest radiation was in the cambrian time. Today, more than 10,000 species are known. They range in size between 1mm up to more than 70 cm. The name Trilobite means "three-lobes". This is because a Trilobite can be segmented in a central axial lobe as well as two symmetrical pleural lobes. The body also can be segmented into Head (Cephalon), Body (Thorax) and the Tail (Pygidium). 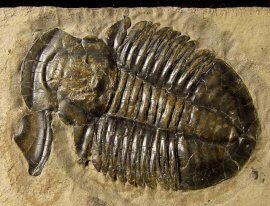 Trilobites were the first animals on earth that evolved complex eyes. Those compound eyes were made of calcite with a high number of single lenses. There are three different eye-types known. Holochroal eyes (great number of lenses, sometimes over 15,000), Schizochroal eyes (less number of lenses, approx. 700) and Abathochroal eyes (only about 70 lenses). Of course there are also blind species, many of them, like the Agnostida, are secondary blind, meaning they have lost their eyes during their evolution.